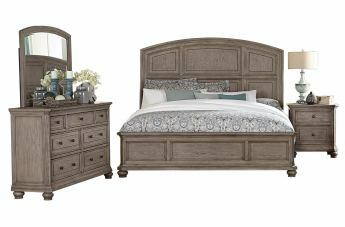 Transitional styling is paired with classic appointments and modern technology to create the Lavonia Collection. 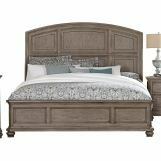 The eye-catching dramatic curve of the headboard creates instant appeal when taking in the design of this collection. 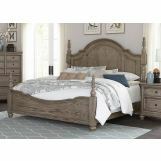 The framing of the headboard carries over to the design of the low profile footboard and turned-foot supported recessed drawer front case pieces. 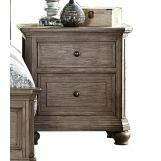 Modern technology comes into play with the power strip – with USB port – charging station that is mounted to the upper back of the nightstand. 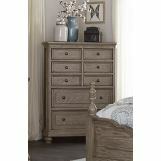 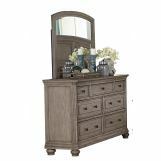 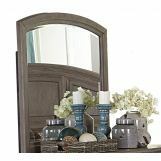 A gray wire-brushed finish over oak veneers furthers the classic look of this bedroom collection.